He begins at the beginning, and in fact Blue is indeed the beginning, but the date is a bit of a surprise. On page 56 of the paperback original McGee calls a Mrs. William Callowell looking for a pilot who flew with Cathy Kerr’s father in World War II. Thinking he is looking for her husband (who died recently) he is told that the pilot he is looking for is in fact her son, who is out of town at the moment. She tells McGee “... he will be at the convention in New York City through Tuesday the ninth.” The very next page in the book informs the reader of the specific month of the year with a classic JDM sentence: “Manhattan in August is a replay of the Great Plague of London.” So it’s August ninth. A check of the calendar reveals four possible matches: 1949, 1955, 1960 and 1966. The first year is way too early and the last violates Pratt’s copyright rule, leaving 1955 and 1960 as the two possibilities. He eliminates 1955 based on an extensive reconstruction of McGee’s life between the Korean War and Blue (he would have been in college in 1955) leaving 1960 as the year Blue takes place. The call to Mrs. Callowell was made on August third (p. 56), which was the day after McGee returned with Lois Atkinson to find “nine days of mail” (p. 49). Counting back from August second (Tuesday), nine mail-delivery days brings us to Saturday, July 23. This in turn leads to some uncertainty regarding the actual starting date of the story. The adventure begins some unspecified evening, with Chookie McCall working on dance routines on the Busted Flush. The next evening McGee goes to the nightclub to see Chookie’s friend Cathy. This cannot be a Monday, as the club is closed Mondays (p.23). the next day he goes with Cathy to visit her sister, and the same day begins his ministrations of Lois. If this day is assumed to be Saturday, July 23, per the “nine-days-of mail” calculation, Chookie must have been to visit him on Thursday, July 21. However, the visit takes place during what would be performance hours at the club, as it is unlikely that there would be no show on a Thursday night. The only night which Chookie would have been free to visit McGee would be the Monday of that week, July 18. Blue ends “On the late November day when I left…” Candle Key after spending from late September to November with Cathy (pp. 140, 143). Although Nightmare in Pink was published the same month as The Deep Blue Good-By, Pratt firmly establishes the fact that the action in the novel takes place several years after that of the first adventure. The reader is informed on page six that Nina Gibson’s fiance was murdered on “Saturday, August tenth.” This date falls in 1957, 1963, 1968 and 1974. The last two violate the copyright rule and 1957 is eliminated for a couple of reasons. One, Pratt surmises that use of hallucinogenic drugs in the story strongly suggests 1963 over 1957, as “knowledge of such drugs [in 1957] was fairly uncommon, and the use of them in a story would have been unclear to many readers.” Subsequent revelations about the CIA’s experimentation with the drug as a possible mind-controlling agent during the 1950’s put this theory in some doubt now, but it is impossible to know if MacDonald was aware of this in 1964. I’ve always felt that Pink read like an older novel than Blue, so I wouldn’t be adverse to placing it in 1957 except for Pratt’s other reasoning: it conflicts with McGee’s biography (as surmised by Pratt) that in October of 1957 McGee would be a rookie on a never-named professional football team. Another entry that falls way out of the publication chronology is Orange. Although published in 1965, Pratt “firmly” places the action of the book in 1962. The fifteenth chapter begins with “On Thursday at high noon, on the last and most beautiful day of May…” which produces candidates in 1951 (way too early), 1955 (conflict: McGee was in college), 1962 and 1973 (copyright rule). This leaves 1962 as the only possible candidate. Gold also falls in a different order, based mainly on “internal evidence” that places the action in 1963. Without any specific dates being linked to specific days of the week, Pratt uses McGee’s conversation with Cuban expatriate Raoul Tenero and his involvement with the Bay of Pigs invasion to eliminate some years and focus on others. At one point McGee remarks that bad guy Carlos Menterez y Cruzada fled Cuba “nearly five years ago” and Betty Borlika’s contention that he was “very close to Batista” allows one to use Castro’s ascension to power in January 1959 as a starting point. This leaves 1963, as it is highly unlikely that anyone “close to Batista” would have wanted to hang around the island, especially one with the collection Menterez y Cruzada owned. It is the first seven novels in the McGee series that fall wildly outside of their publication dates, and from Yellow on the action in them pretty much match the years the books came out. Three of the early novels -- Purple, Red and Amber -- have questionable dating, since there is a lack of focus points, but Pratt uses other means to attempt to date them. Purple takes place in late 1961, as the action spans from October to January, and assuming that Purple does not predate Blue, it leaves only one year without conflicts from other novels: 1961. The same problem occurs with Red. It begins in February and ends in March, but what year? Again, eliminating years that conflict with other books, Pratt concludes that the action takes place in early 1961. Finally, Amber lacks specific day-date references, although it does specify the month it begins (June) and the month it ends (July). Eliminating conflicts, it could take place in either 1964 or 1965. Pratt chooses 1965. 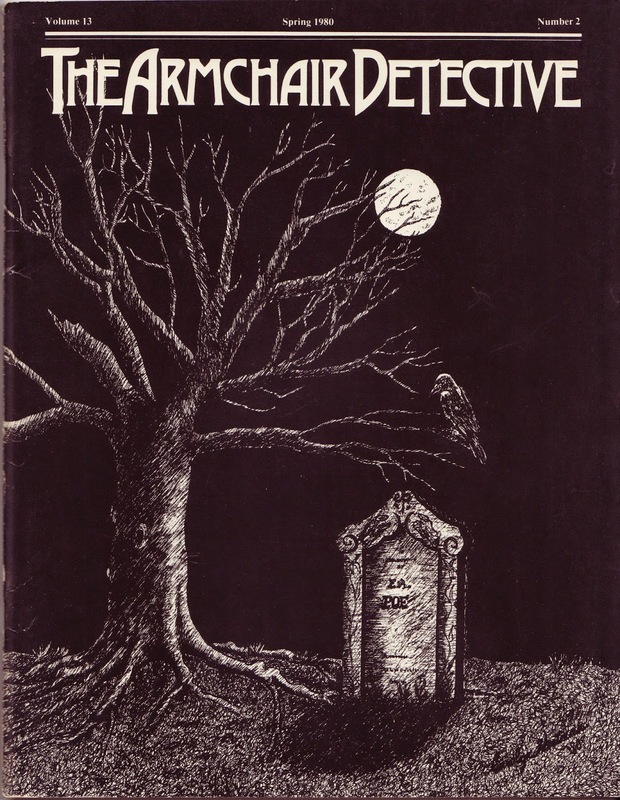 It’s not surprising to me that the early novels fall all over the map chronologically. 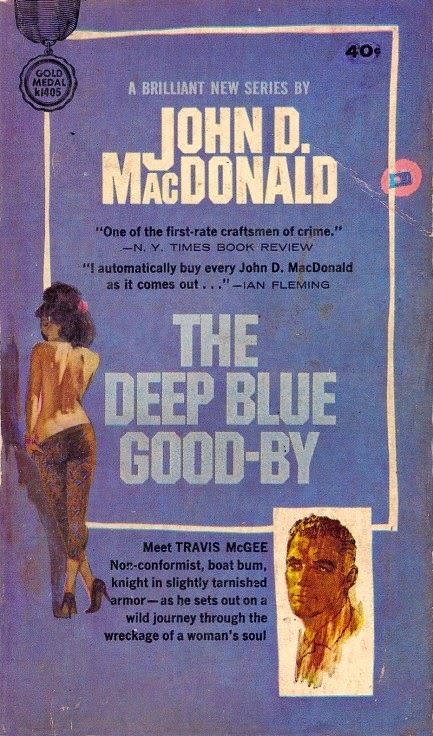 Anyone familiar with the creation of the character of Travis McGee knows that the series began with a couple of discarded attempts at Blue, a major problem with Red and earlier novels beginning out of their published order. Red was actually the third McGee attempted, but it fell apart and he had to come back to it later. Also, Gold was written before Purple, but published afterward. (See “The Difficult Birth of Travis McGee” for the full story.) So here is Pratt’s new chronology, and it’s one that works well for me, with the possible exception of Pink, which I believe could predate Blue, but not enough to quibble with the excellent research done for this article. The next time I tackle the canon (which I do every couple of years) I think I’ll do it in the following order. Recall that this article was written in 1980, so the chronology only goes up through Green. Obviously some of this proposed chronology needs rethinking. From the comments posted below by an anonymous reader, it is evident that there are real problems with Pratt’s dating of two of the earlier novels. Let’s start with Red. 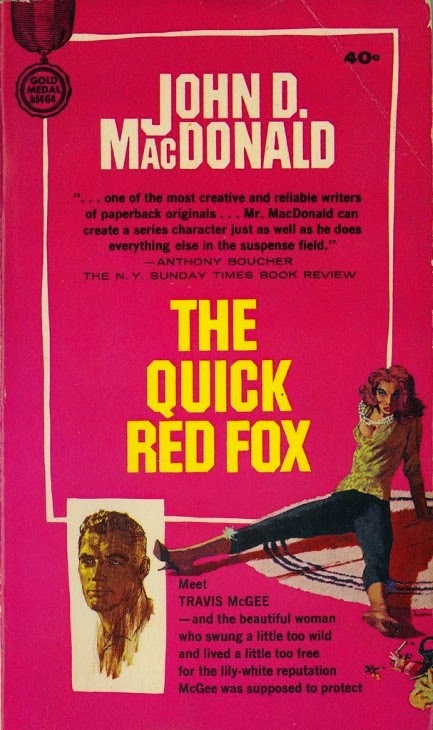 It was the third Travis McGee novel written, but that version was scrapped and another one (Gold) written before MacDonald went back and re-did Red. The reference to Kennedy Airport that the reader spotted is certainly an indication that the action takes place after December 1963. Now, one could argue that perhaps this change was made by an editor not knowing when the novel was supposed to take place, but that is sheer guesswork. Another possibility is that McGee inadvertently used the current name of the airport when relating a tale that took place earlier. I seriously doubt MacDonald intended something like that. More problematic is a reference I spotted that seems to me even more damning of the proposed 1961 dating. On page 68 of the first edition Travis arrives at the Mohawk Lodge in search of Carl Abelle. As he enters the main lounge he hears “a big stereo” making “loud Beatle-music.” That’s an obvious dating point to anyone of my generation and it should have been just as obvious to Pratt, since the Beatles’ amazing popularity in the United States didn’t occur until after their appearance on The Ed Sullivan Show in February of 1964. In 1961 The Beatles began the year playing the Cavern Club and ended it on their way to their Decca audition, before they had a recording contract and certainly before anyone in the United States had ever heard of them. The flaws in placing Blue in 1960 are just as daunting. “Anonymous” points out the fact that Junior Allen was imprisoned in 1957 and was incarcerated for five years, which places his release date in 1962, two years after Pratt’s proposed 1960 dating. But there are other dates that can be arrived at by simple addition or subtraction. Cathy Kerr tells Travis that she was six years old in 1942 when her father entered the service, placing her year of birth as 1936. When Trav first meets Cathy he observes “I could see that she was elderly by Chook's standards. Perhaps twenty-six or-seven.” Assuming Travis is correct (and when it comes to women, when is he not? -- well, okay, Mary Alice McDermit notwithstanding…) this would place the action in either 1962 or 1963. The later year is the likely candidate, based on the following: Allen is released from prison in 1962. After what he has learned from cellmate David Berry it is highly likely that he made his way to the Berry home immediately upon release. He gets a gas station job, woos Cathy, eventually locates what he is looking for then disappears. When relating the tale to Travis, Cathy states “Last year a man came to us, name of Junior Allen.” So clearly the action takes place in 1963, when MacDonald was writing the book. So, after these changes Pratt’s dating of the early novels begins to fall apart. 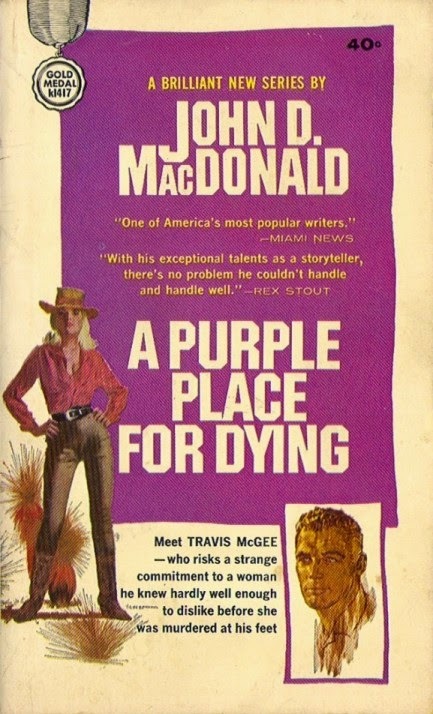 Removing Blue and Red from their first and second positions leaves Purple as the first Travis McGee adventure, but Pratt placed Purple in third position (1961 - 1962) only because he took Blue as the first in 1960, and there are conflicts with other books in every other period except ‘61 - ‘62. Still, there’s nothing I can find that eliminates Purple from this period, unlike Orange, which has a definite date marker (“Thursday… the last... day of May.”) placing it in 1962. So, after spending way too many hours playing this game I’ve come to the conclusion that MacDonald had no secret chronology placing later books into earlier periods, despite the dating clues he gives. The novels probably took place in the order he wrote them, which is pretty much the order in which they were published, despite some seasonal overlap in the earlier adventures. Steve...I was expecting a mention that JDM published the first three either back to back or at the same time at the request of the publisher. From what I recall the publisher wanted the public to get 'hooked' on the series which of course they did. That and then some! I, too, an rereading for the third time but I have separated them by years not months. So congratulations to David Lee. What a guy, just finishing TM, then starting again. In depth research, that's for sure. Congrats to the writer! Great stuff. I guess JDM wasn't big on throwing out year dates ("It was a hot and steamy night in 1961..."). And yes, I always thought/assumed that Deep Blue took place in '64! The Deep Blue Goodbye takes place in or after 1962, Junior Allen was jailed in 1957 for 8 years but got out in 5, so he would have been locked up in 1960.